Your legs are now the car's crumple zones . . . front and rear. If you happen to be a fan of the original 1980s cartoon version of Transformers, we know what you’re thinking. This shortened yellow Volkswagen Beetle is probably the closest you’ll ever get to an honest-to-goodness real-life representation of the original animated Bumblebee. He wasn’t actually run-of-the-mill Beetle, but a microcar version of the venerable bug. And that, folks, is exactly what we have here. The folks at 1320 Video happened upon this crazy creation in Qatar of all places. The crew was at Qatar Racing Club and spotted this Beetle across the pits, and obviously, they had to check it out. What they discovered was a fully functional VW, still driving the rear wheels with the engine in the back as it should be. In fact, looking at the car from the front or rear you wouldn’t be any wiser to the shenanigans happening in the middle. And as these screencap photos show, there are definitely shenanigans taking place. We don’t have much information on the build. The current owner bought the car pre-shrunk off eBay, and actually, he didn’t believe it was real until it was delivered. 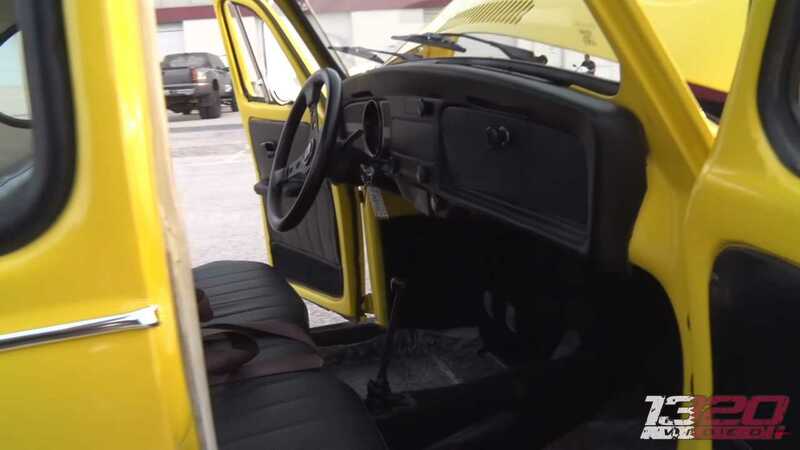 Obviously the center section of the car is missing, and if you look closely inside, you’ll see the bench seat is actually the Beetle’s back seat. The roof and doors are custom fabricated of course, and there certainly isn’t much room inside. There's even less room trying to squeeze through the tiny doors. However, it looks like an absolute hoot to drive. The shortened car should also be lighter on weight, giving the stock-looking VW engine less mass to lug around. We’re not sure how comfortable we’d be driving the car at any appreciable speed – the ultra-short wheelbase already has the car lurching back a surprising amount when the clutch is dropped. At least with the engine in back it shouldn’t flip over during hard braking. We think. If only it could turn into a cool robot.